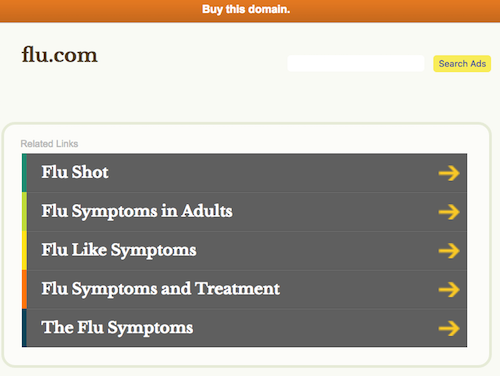 I was looking through the upcoming auction list on NameJet, and I saw an interesting domain name for sale: Flu.com. I saw that this auction has a reserve price, so I knew that it was a private listing rather than an expiring domain name auction. Interestingly, Whois records show that Flu.com is owned by a company called Medimmune, which is described as the “global biologics research and development arm” of pharmaceutical giant AstraZeneca. It looks like AZ has a flu vaccine, but it doesn’t appear that this is going so well, according to an article in the Wall Street Journal this Summer. Archive.org shows that Flu.com was once used as a forwarder to FluMist.com, but the most recent Archive.org entry I found was from 2013. I am unsure how long Flu.com has been parked. If the Flu.com domain name is of interest, you will need to come prepared to spend quite a bit of money. The reserve price range for Flu.com is between $500,001 and $750,000. The current “high bid” is $100,000, although that doesn’t really matter since bids below reserve price don’t really mean much. The Estibot valuation for Flu.com is $310,000. The auction is open for pre-bidding / backorders for a little under two weeks, at which point it becomes a public auction. Reserve Price at 500-750k is too high, IMHO it won’t sell. Don’t think they will find many end users on NJ. If AZ wants to sell it on NJ, they have to price it wholesale. Hi Elliot, We have this listed for sale through NameJet -its my listing for our client. Its one of the best and most valuable LLL names with meaning available. And we all know that there will always be a Flu season for as long as all of us live and remedies, etc. to address the condition. There are also some other great medical related names on NameJet – http://www.namejet.com/featuredauctions/VH1104jkws listed by others as well. Confirming that Flu.com is very valuable, the market is huge and there are recom to use vaccinations , so this one is a serious domain !